Another common Inquisitorial agent is the bounty hunter, individuals skilled in hunting down criminals whose skills are of great use to Inquisitors. 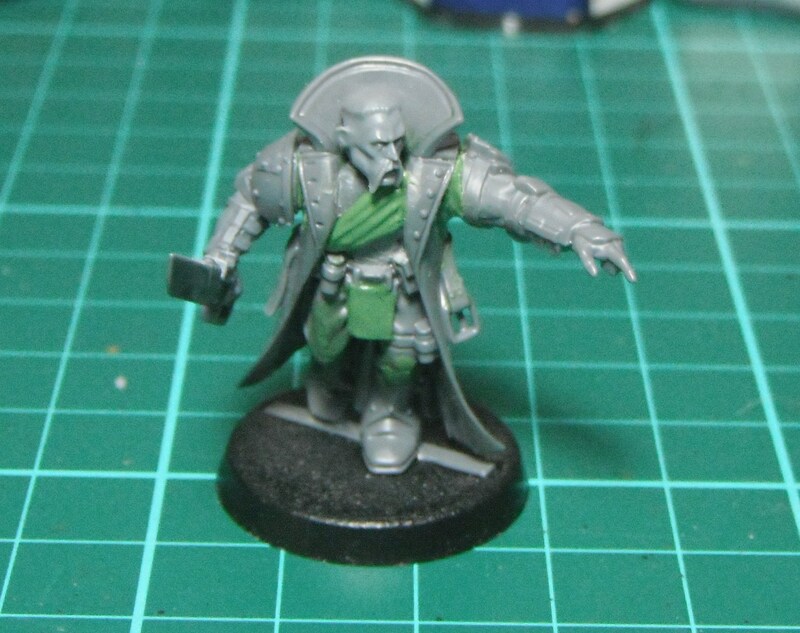 While building this model I had an image of Harlon Nayl from Dan Abnett’s Eisenhorn and Ravenor books in my head. He is described as wearing a long stormcoat over a black bodyglove and having a shaved scalp. While the model isn’t intended to be a direct representation of Harlon I have incorporated elements such as the long coat and shaved head (although I left the original Mohawk as it looked cool). I also gave him some body armour, always useful when your line of work involves being shot at a lot. 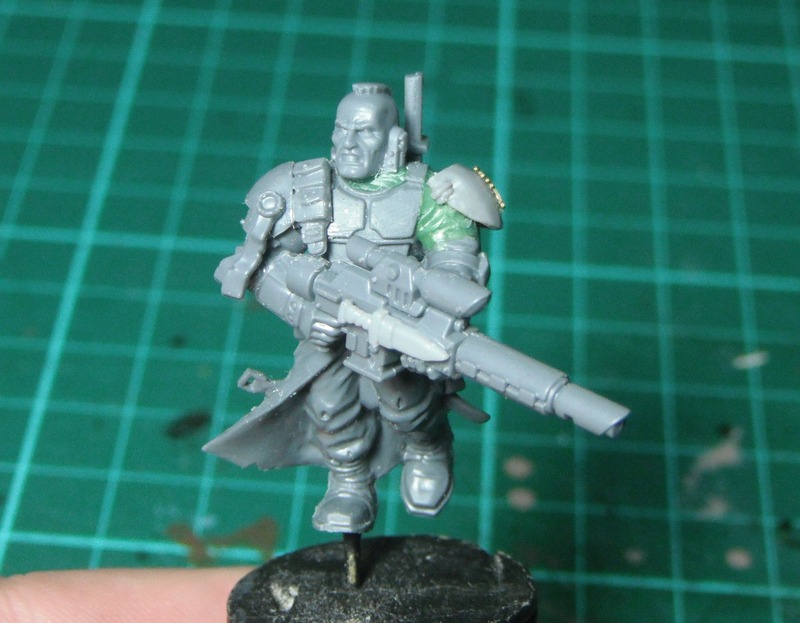 The main part of the model is made from a Cadian’s torso attached to the legs of one of the ever-useful Dark Vengeance cultists. I really like the design of the lasguns carried by the scions and converted a pair of arms from the scions kit to fit. I resculpted the left shoulder and hid my rough greenstuff work under a kroot shoulder pad adorned with an etched-brass symbol. A small holstered knife provided the finishing touch to the weapon and gives the impression that he is armed to the teeth. The rest of the model was decorated with purity seals, pouches and grenades. I decided not to use the backpack from the scions kit as the hanging wires attached to the weapon hid the trenchcoat which is one of the defining features of the model. 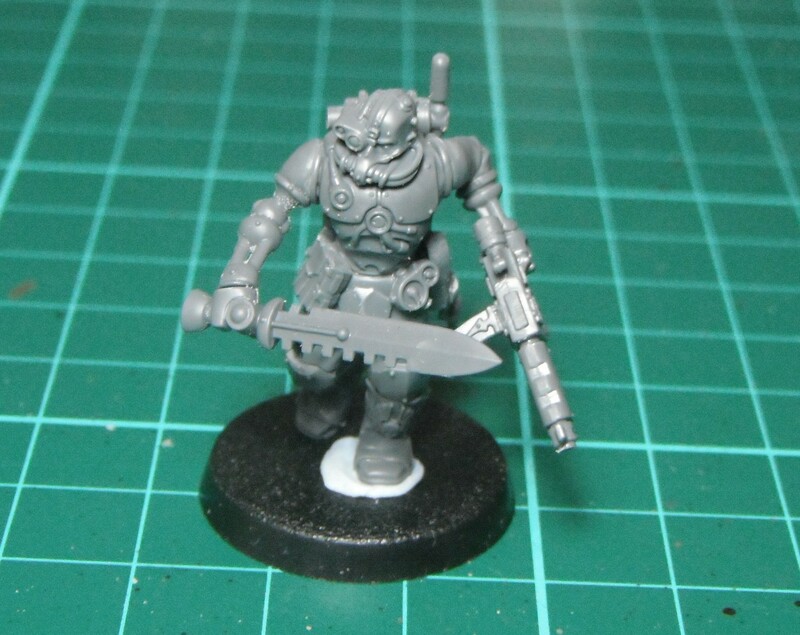 Instead I used a pouch from the ogryns set as a backpack and attached a space marine knife. Overall I am very pleased with this model, especially as I didn’t have a clear idea of what parts I was going to use at the beginning, just an image of what kind of character I wanted him to be. 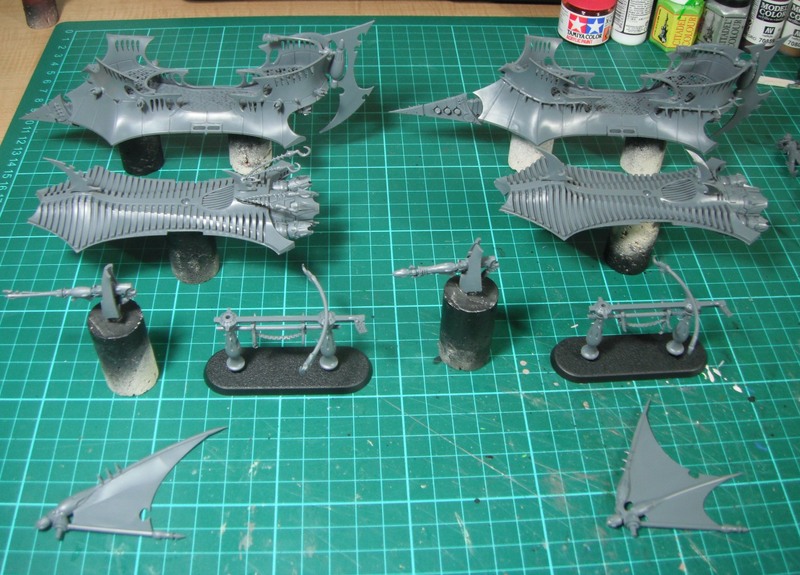 The rest was a case of trial and error using blu-tak to try out the parts first before gluing them together. Here are my assorted characters for Inq28. Initially the models were created to be a part of my Inquisitor’s retinues but as I worked on them they have developed their own characters and I am planning on splitting them into two warbands, one for my Inquisitor and one for my Rogue Trader. I imagine the Rogue Trader to be an ally of my Inquisitor who provides him with transport when needed which means the warbands will fight together on occasion, allowing me to mix and match models for different scenarios. The first character is a Rogue Trader inspired by an old illustration by John Blanche. 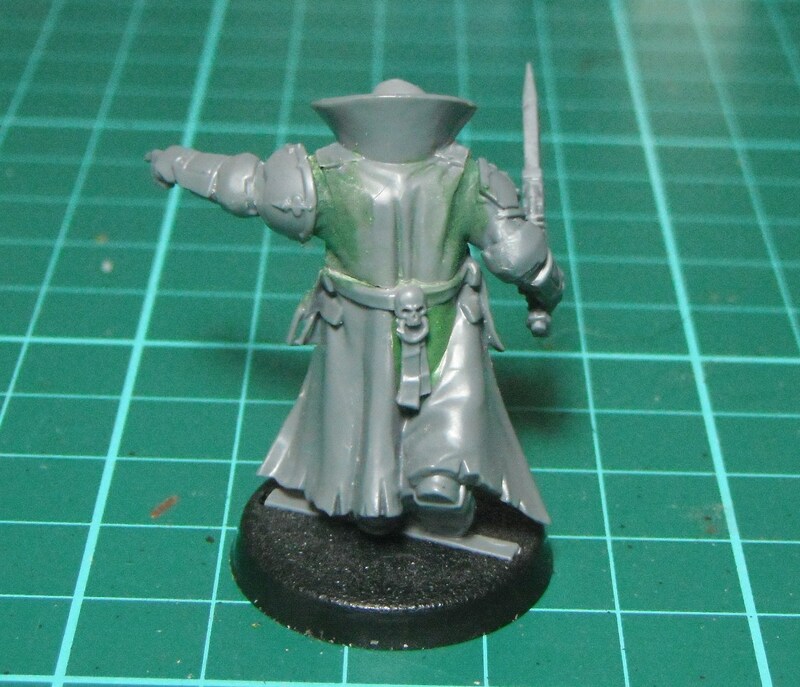 The model is the chaos cultist wearing a commissar’s from the Dark Vengeance set. His head was swapped for one from the Empire Greatswords and the arms come from the Scions kit. 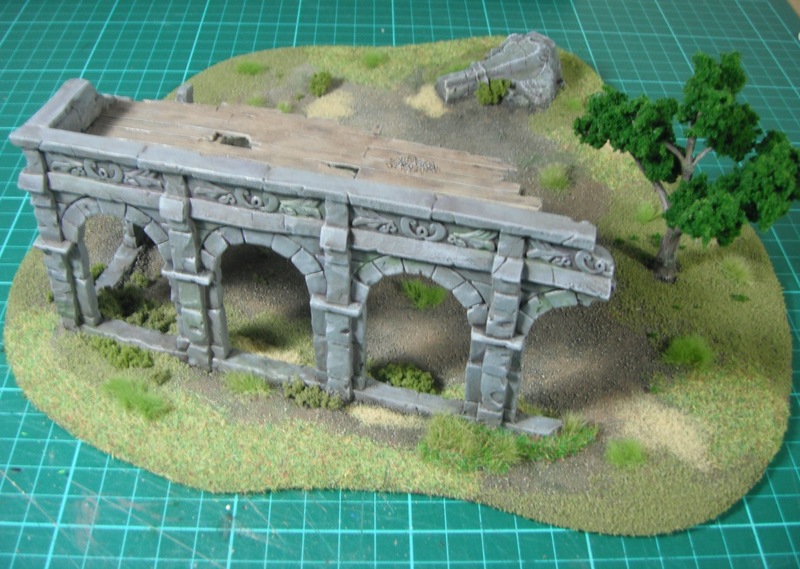 A bit of greenstuff work filled in the rest. Initially he was intended to be used in my Inquisitor’s warband but I decided that Rogue Traders are too important to just be henchmen and decided to give him his own warband. Plus I liked the idea of playing with a Rogue Trader and his retinue as the swashbuckling fortune-seekers would play very differently to the more austere Inquisitors and their agents. 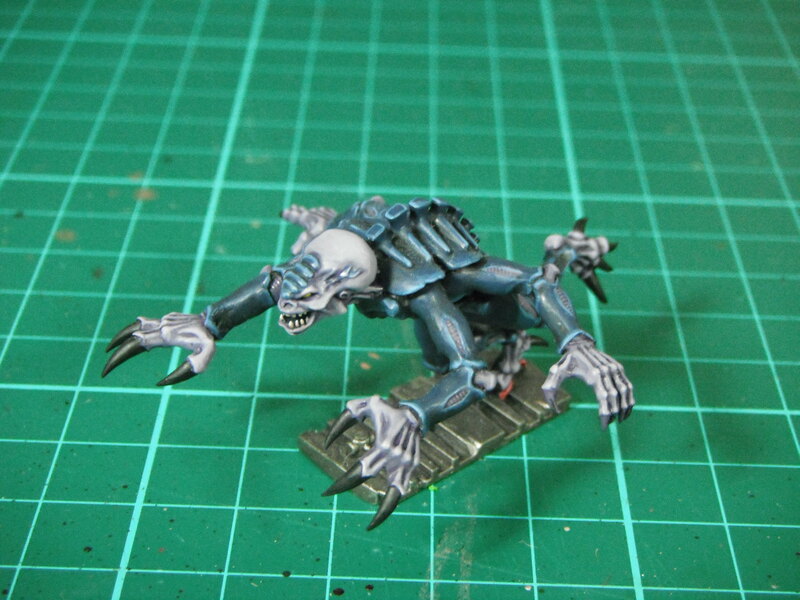 I would like to add some abhumans or aliens to his warband at some point in the future. 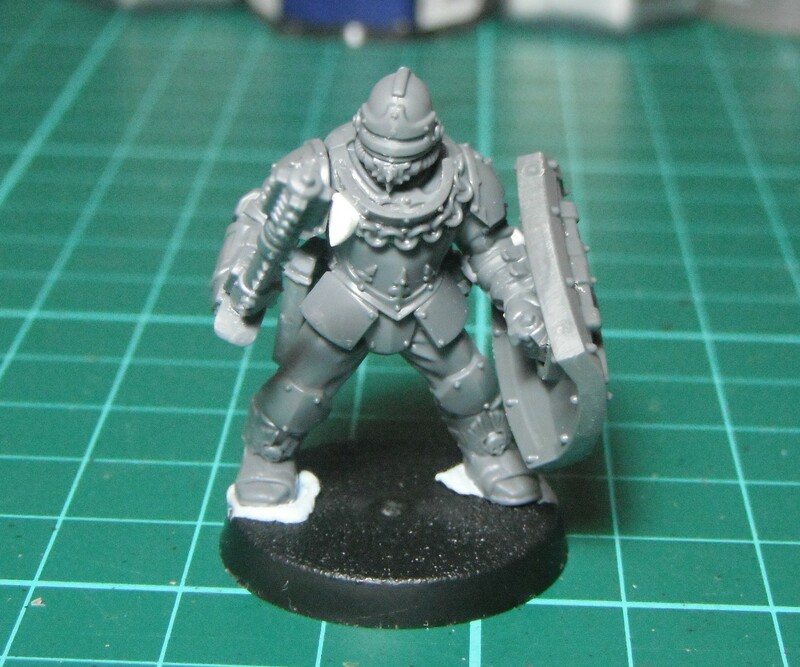 The next guy is a heavy stubber-wielding muscle man who will form part of the Rogue Trader’s retinue. 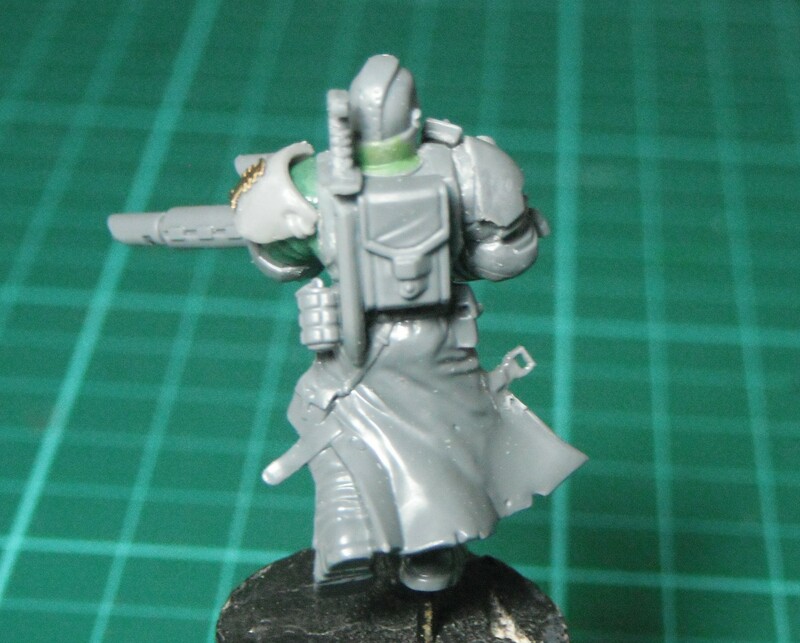 Again, a Dark Vengeance cultist with a simple head swap and some added details. 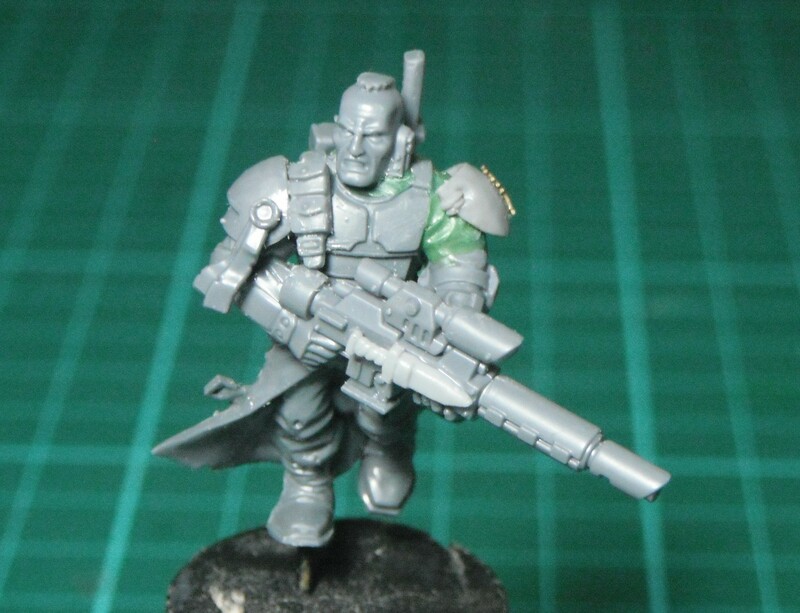 For this guy I wanted to stay clear of the usual archetypes of him being a hive ganger or former guardsman as these character types usually are. Instead I see him as a rating or other crewman from the Rogue Trader’s vessel who labours on the ship and is strong enough to carry a heavy stubber. Here is an Adeptus Arbite enforcer who is one of my Inquisitor’s retinue. 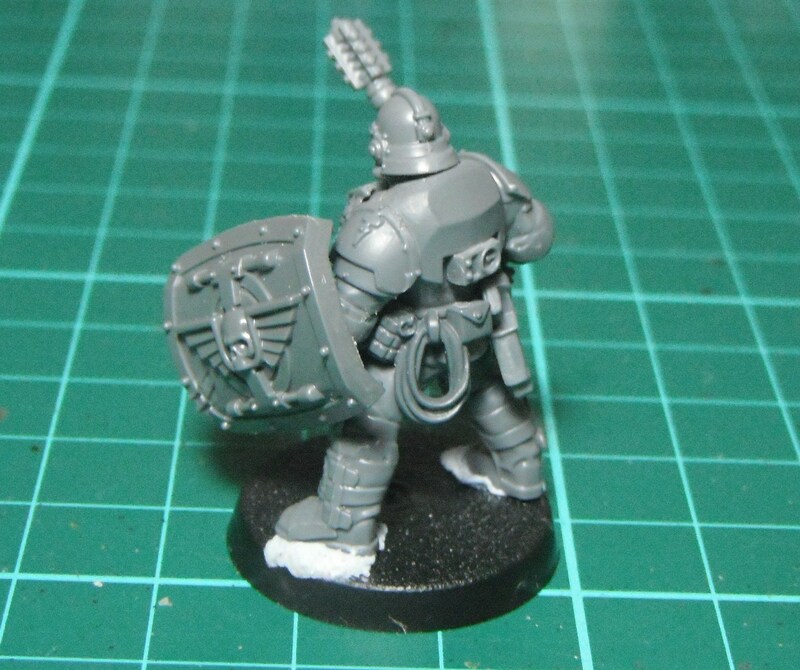 The conversion is closely based on one I saw on The Convertorum and is a combination of Scion and Mechanicum parts with a shield taken from the Ogryn set. I was always very fond of Magos Delphan Gruss from the Inquisitor game and knew I wanted to include a techpriest in one of my warbands. I have seen loads of conversions based on the Vampire Counts wraith model but I wanted a more traditional, human-looking magos. the model itself is a data-smith from the Kastellan Robots kit with a simple head swap. He will probably join the Rogue Trader’s crew, helping to maintain the ship and using his position to explore the galaxy for STCs and other archeotech. 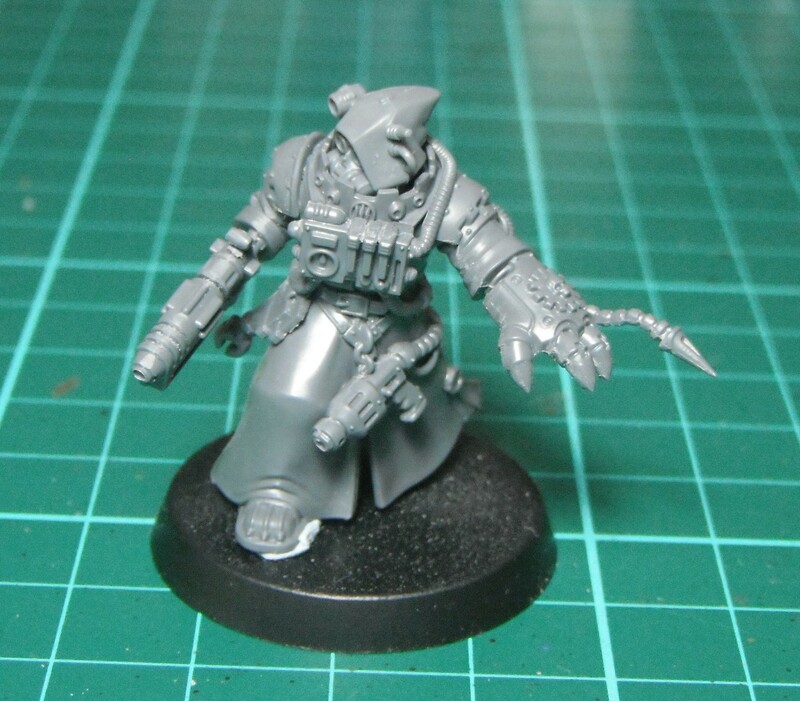 The techpriest will be joined by a combat servitor kitbashed from Mechanicum and Scion bits. Because a number of models intended for my Inquisitor’s retinue have been co-opted into the Rogue Trader’s warband I will need to create some more models to accompany my Inquisitor into battle. 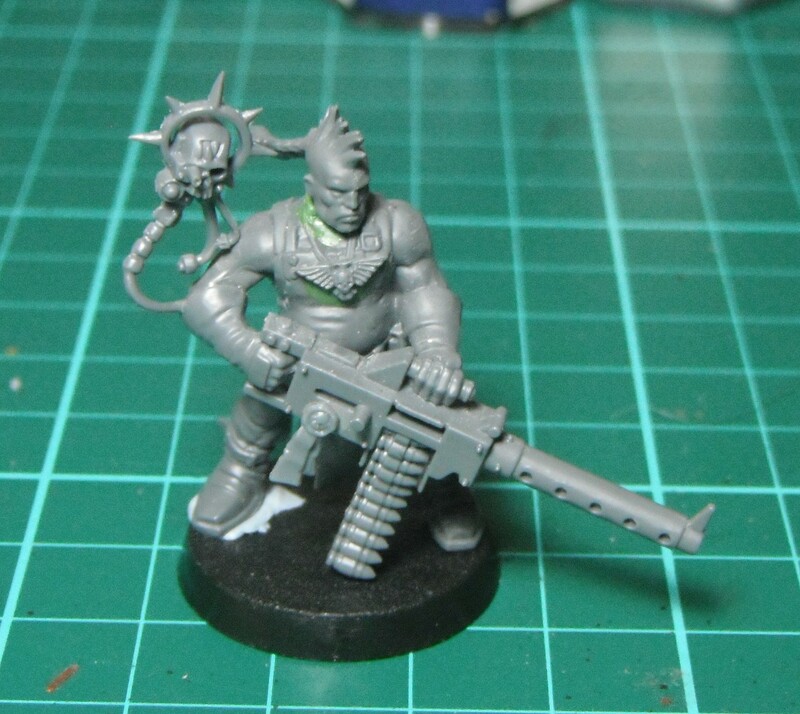 I have already started work on the next conversion and hope to share him with you soon. 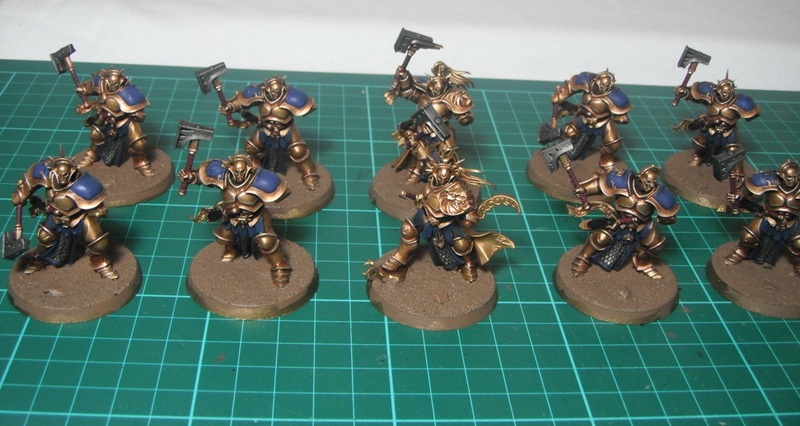 Yesterday I said that I would show my progress on the Liberators. Well, here they are. The armour is finished and most of the other colours have been blocked in and shaded. 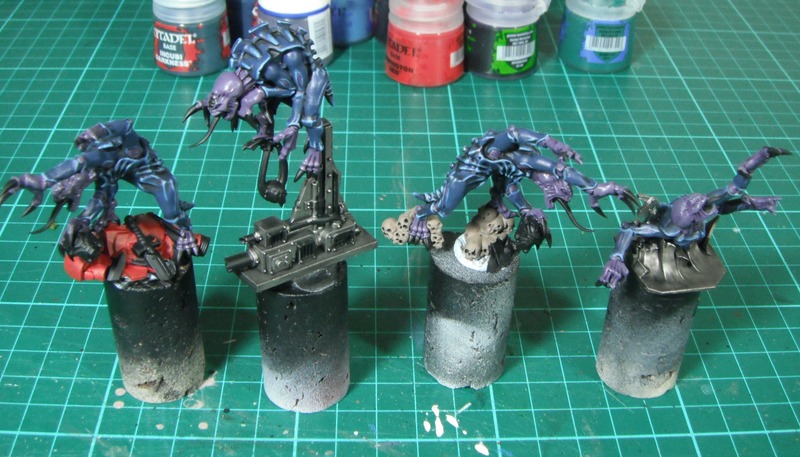 I followed the video guide on GW’s website but used Macragge Blue on the shoulder pads rather than Kantor blue as suggested. This is both because I wanted a brighter blue and because I want to differentiate between the blue armour plates and the blue leather elsewhere on the model. Here’s a close up of one of the Liberators. I recently picked up the new Age of Sigmar boxed set from Games Workshop. I’ve never been a huge fantasy player but the models in the set are fantastic. 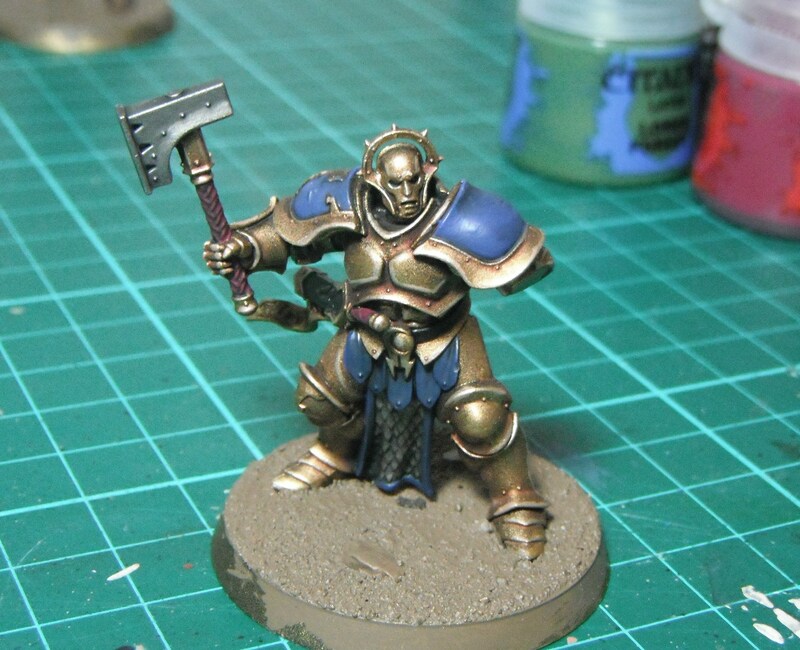 The main draw for me was the Chaos army but I also fancied painting up the new-kids-on-the-block, the Stormcast Eternals. 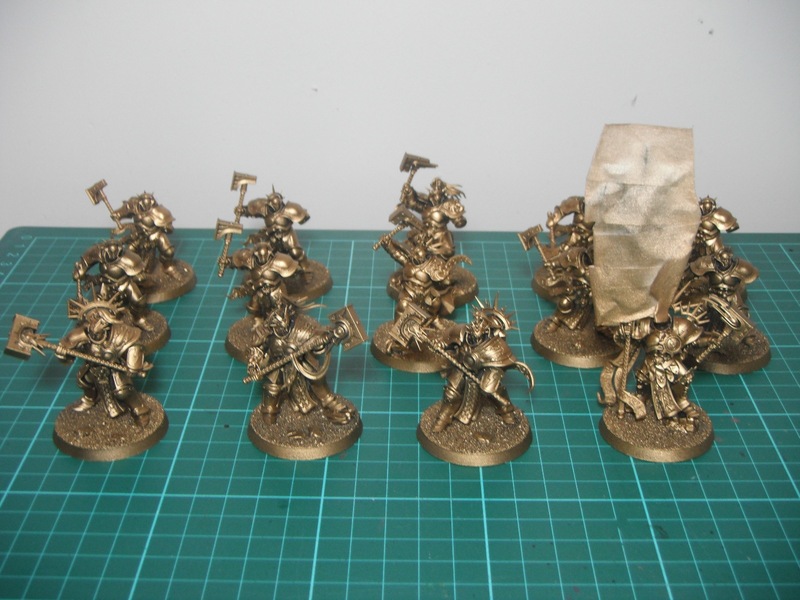 The idea here is to get them painted up quickly following GW’s official painting guide and then sell them on. I assembled all of the models in a single evening (with the exception of Valdus Hammerhand who I will focus on individually) and yesterday I moved on to the painting. 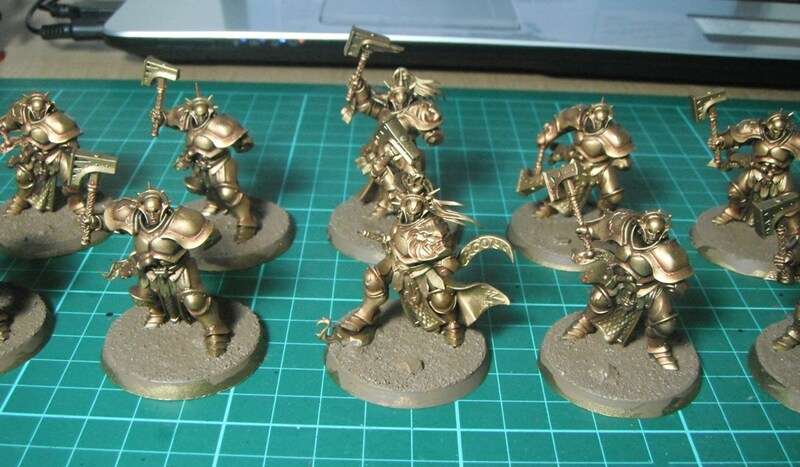 Initially the models were primed black and then sprayed using the new ‘Retributor Armour’ gold spray. I must say, I really like this spray and it applied smoothly and evenly without fuzzing or clogging details. 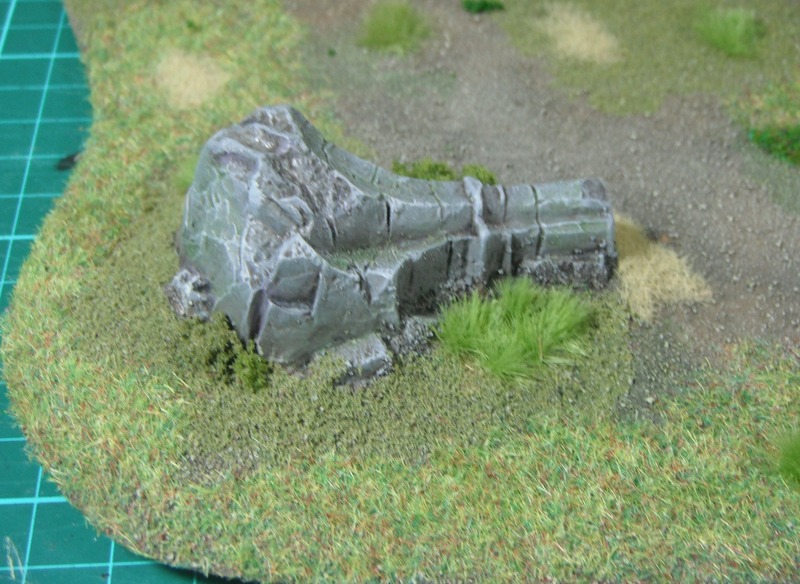 I used two thin coats here to build up the colour. 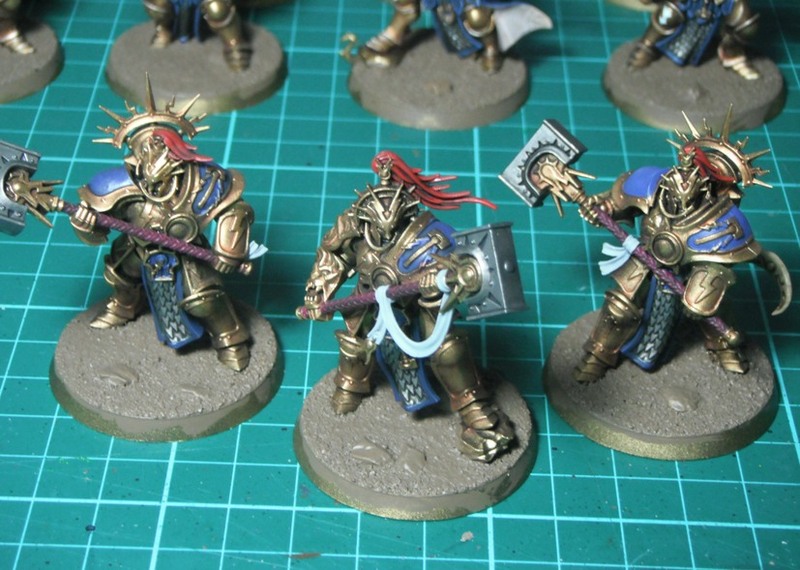 The models were then shaded using Reikland Fleshshade and edge highlighted Auric Armour Gold followed by Liberator Gold. As I type, the models are much nearer to completion than in the photos but you’ll have to come back tomorrow for more pictures.